Abstract – College journalists often have their work evaluated by campus Media Advisory Boards. Student editors complain some boards have used their oversight role to censor or indirectly exert control over the print or broadcast product. This exploratory study seeks to determine how often Media Advisory Boards exist and what factors correlate with a school having such a board. This study, based on a national survey of members of the College Media Advisers organization (N = 157), is designed to provide baseline data on such questions as how boards differ in title and size, what characteristics of a school help explain differences in the composition of a board, and what are the most common functions of a board. The results can be useful to schools considering creation of such a board, to schools examining the operations of their current board, and to various constituencies – student editors, journalism faculty, administrators – involved with the student press. When publisher Joseph Pulitzer suggested creating the first collegiate school of journalism in the 1890s, he battled with Columbia University officials over a proposed advisory board for the school. The disagreement delayed the project, and while Pulitzer endowed the journalism school with $2 million, he died before the school could open (O’Dell, 1936). The dispute was the first of many conflicts regarding college administrators, campus journalism, and advisory boards. In the ensuing 100-plus years, problems continued as more journalism programs were created, student newspapers and broadcast operations followed, and schools worked to find a balance between respecting the First Amendment tradition of the press and the desire of colleges to protect their reputation and manage themselves successfully. Many colleges and universities responded by creating Publication Advisory Boards, often composed of administrators, faculty advisers to the media, other faculty members, student editors, students at large, and professional journalists from the local community, to provide a variety of perspectives on such issues. As broadcast operations grew on many campuses, the boards were sometimes reconstituted as Media Advisory Boards. This study focuses exclusively on Media Advisory Boards, albeit from solely an adviser’s perspective. In the 21st century, how often do Media Advisory Boards exist, and what factors correlate with a school having or not having such a board? How do they differ in such characteristics as title and size? What characteristics of a school help explain differences in the composition of a board? What are the most common functions of a board, and do they differ from what the adviser sees as the ideal? Are advisers satisfied with board performance; do they feel administrators exert too much influence on boards? This study, based on interviews with members of the College Media Advisers organization, is designed to provide baseline data on such questions. Such an exploratory study can be of use to schools considering creation of such a board, to schools examining the operations of their current board, and to various constituencies — student editors, journalism faculty, administrators – involved with the student press. When officials at Utica College in New York proposed forming an oversight board for the student newspaper, the five top editors and the faculty adviser all resigned (Student Press Law Center, 2003c). Boston College tried to place stipulations on its contract for office space with The Heights student newspaper in 2003, mandating the establishment of “an ‘active advisory board’ made up of Boston College faculty and staff, including at least one administrator.” Student editors said it was an attack on their independence (Student Press Law Center, 2003a). Student journalists brought a First Amendment lawsuit against Ocean County College officials in New Jersey after a woman was fired from her position as faculty adviser to the school newspaper. A settlement mandated creation of a Student Media Advisory Board; the board was to include leaders of the campus student media, local media professionals, faculty advisers, and student body representatives (Ingram, 2010). At Fairfield University in Connecticut, where the authors of this study are employed, the school created a newspaper advisory board in 2009 to help deal with such issues as a student protest regarding a newspaper column on “The Walk of Shame” (Keister, 2009). Disputes involving advisory boards continued into 2011. In Virginia, administrators at Christopher Newport University were criticized for trying to undercut the authority of the seven-year-old Student Media Board that oversees budgeting for the newspaper, radio station, and fine arts magazines. Student editors said the administration wanted to end the print edition of the newspaper because of investigative stories that put the school in a negative light (Shalash, 2011). At the University of Texas—Tyler, the sudden firing of the longtime adviser to the Patriot Talon newspaper prompted the school’s Student Media Advisory Board to investigate her claim that she was ordered to “tell the students what to write” (Zweifler, 2011). These varied cases show how some schools, when faced with a modern-day problem regarding the student press, often turn to their Media Advisory Board – or create one should emergency arise. Once created, the board can serve many different purposes — some to the benefit of the student press, some to its potential detriment (Summarized by Click, 1993; Ingelhart, 1993; for a more recent, brief summary, see Turner, 2008). Despite their widespread use – and widespread complaints about them – Media Advisory Boards have rarely been the main focal point of academic research. William Click devoted a chapter to the boards in his seminal “Governing College Student Publications” (1993), but the material is descriptive and anecdotal, and there is no evidence of a formal study. More often, we have only the individual accounts of problems on a given campus, scattered references in academic research that focuses primarily on other topics, but no comprehensive look. The student Media Advisory Boards under discussion here, which often include off-campus members, can be seen as part of a broader effort by colleges and universities to use professionals in the community to bridge the gap between academicians and practitioners (Teitel, 1995). Teitel said interest in such advisory boards and committees comes as “the scope of demands and expectations for responsiveness and accountability has increased, requiring greater interaction with the world outside the ivory tower” (p. 59). Business schools routinely create departmental advisory councils in an effort to keep their curriculum relevant to the needs of the workforce (Kress and Wendell, 1993). For example, one business program formed a Technical Communication Advisory Board, consisting of faculty, students, and outsider advisers, to give advice on course offerings and recruiting students (Dorazio, 1996). In journalism and mass communication, a 1994 study of 163 JMC programs found 51.5 percent had a “(m)edia advisory board or board of visitors that includes industry professionals” (Self, 1994). Ten years later, Henderson surveyed 61 JMC programs with current or former departmental advisory boards. She reported interest in academic advisory boards in general had “recently experienced something of a resurgence. … (Y)et, for all their rapid growth, very little has been written about them” (p. 60). She included a list of areas where boards have interacted with students, and one area was “student newspaper procedures” (Henderson, 2004). Pullen (2005), saying that “doing more with less” is expected today in academe (p. 27), argued that creating an advisory board was one way to help build healthy JMC programs and deal with growing enrollments. More recently, a 2011 national survey of JMC departments found that many do use journalism professionals on advisory boards. These professionals can serve as auditors of academic programs and provide feedback on recruiting students and individual courses. But the researchers also found some programs have been reluctant to take advantage of what they called “renown-gown” resources like using local journalists on an advisory board (Benigni, Ferguson & McGee, 2011, p. 54). 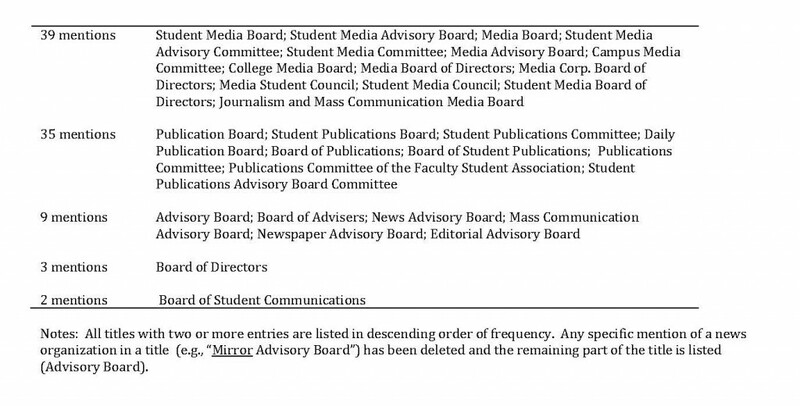 While several national studies have looked at JMC programs that use advisory boards, there is an absence of studies on the narrower category of student Media Advisory Boards designed to help the campus press. A free press? Or at the pleasure of the president? Creation of an advisory board for campus newspapers, television stations, and other news outlets often depends, in part, on the administrative and legal structure under which the student news outlet(s) operate on a campus. The three traditional structures have not changed in past decades (Duscha and Fisher, 1973; also see summary by Brandon, 2001). First, the news operation can be under the direct control of the administration or faculty; for example, at a community college, a student newspaper can be the product of a journalism class workshop in which the professor is the sole adviser. The college president is often the legal publisher. This direct control model was more the norm a half a century ago; a 1952 study found 59.8 percent of the non-accredited journalism programs exercised “close supervision” of a paper’s editorial content; among accredited programs, 24 percent used close supervision (Bert, 1952). A second structure allows the news outlet to operate in a semi-autonomous state; the student organization often receives free office space and can receive administration or student government funding. Instead of any prior review of published material, student editors often work with an advisory board to obtain feedback after publication. The board, itself, is often the official publisher. The third structure calls for the student organization to be totally independent of university influence. Several studies have found a very small number of college newspapers meet the criteria for being totally independent of university funding and other ties; the criteria can run up to 26 different indicators (Inglehart, 1993; Yam, 2008; Bodle, 1997). The second and third models are closer to the ideal as outlined in the Code of Ethics of the College Media Advisers, which emphasizes ethical prohibitions against administration or faculty interference in content (College Media Advisers). Legal distinctions about the student press at public schools versus private schools also help determine the structure that governs a student medium. Public schools are government-run, and the U.S. Constitution places curbs on the government’s ability to censor. The president of a private college can exert far more direct control over the student press, including the ability to mandate an advisory board, because the 14th amendment offers all private entities the ability to curb free expression (Lisosky, 2010). The Hazelwood v. Kuhlmeier decision by the Supreme Court in 1988 gave high school administrators the right to censor school papers, and student editors have worried that it could be interpreted as allowing all college administrators to do the same, whether in a public or private school. Hosty v. Carter followed in 2005, saying Hazelwood had raised so many questions that it was no longer clear what freedoms college media enjoyed (Butzow, 2008). Student electronic media on campus have traditionally enjoyed even less legal protection, despite calls for comparable rights (Kleiman, 1996). The role of any advisory board also is complicated by a lack of agreement among campus actors on the primary role of the student press. Brandon (2001) summarizes many of the traditional roles. To the student journalist, the function of the student press may be to obtain experience that can lead to a journalism job. Many students also want to experience such journalistic values as advocating for justice and providing a voice for the voiceless. To a faculty member, the campus media are places where students can be taught writing and editing and/or management and sales skills (Brandon, 2001). As far back as 1965, Mencher warned that to an administrator, a campus newspaper or television news operation can seem more of a “public relations arm” than a “laboratory of life” (p. 216). His account of college editors being “removed from office by outraged college authorities. ‘They were jeopardizing the good name of the institution’” (p. 216) echoes the more recent controversies detailed at the start of this study. Other information on Media Advisory Boards is limited to responses to scattered questions in broader academic studies. For example, a 2009 study of college advisers by Lillian Lodge Kopenhaver and Ronald E. Spielberger asked what university body was technically the “publisher” of the student newspaper. The Publications/Media Board was the publisher at 34.5 percent of four-year public schools and at much lower percentages at private (12.1 percent) and two-year colleges (3.2 percent). They also looked at where student media were positioned in college administrative structures; most media organizations reported to Student Affairs or an academic department, and virtually none of them actually reported to a Media Board (Kopenhaver and Spielberger, 2009). The authors also conducted a broad 1989 study of independent college papers that included several questions on advisory boards, such as whether a board existed, whether it selects the editor-in-chief, and whom the board reports to (Kopenhaver and Spielberger, 1989). RQ1: At what types of schools are Media Advisory Boards most likely to exist, and what characteristics of a school strongly correlate with their existence? RQ2: How do Media Advisory Boards differ in terms of title, size, hierarchical position within a school, and formality of operation? RQ3: What does the composition of media boards look like and what characteristics of schools help explain the compositional differences of the boards? RQ4: From the perspective of the faculty media adviser, what are the key functions of advisory boards and how are the functions prioritized compared to the advisers’ expectations? The value of Media Advisory Boards seems to lie in the role of the beholder. Many of the bulleted student grievances cited at the start of this study complained about boards being heavy-handed in selecting editors and approving budgets. Yet a survey of the chairs of six Media Advisory Boards stressed their boards’ understanding for and respect of the free press tradition of student journalism (Student Press Law Center, 2003a). Click said having a media board approve a student newspaper’s budget can benefit students, and he suggested that student newspapers educate their boards about student journalists’ rights (Student Press Law Center, 2003a). Kopenhaver, who has conducted several annual surveys of faculty media advisers, said, “A good student media board will protect the student newspaper. It will be kind of the buffer if the administration tries to do something in regards to the paper” (Yam, 2008). RQ5: How satisfied are advisers with the performance of the Media Advisory Board? RQ6: What characteristics of the school and of the adviser correlate with higher satisfaction of media board performance? The term Media Advisory Board is used broadly, throughout, to capture endless variations in board titles, as discussed later in the results. This study uses the term, “student media,” to describe student efforts to provide news coverage of activities on campus through college newspapers, magazines, television stations, and radio stations. The analysis refers to print, broadcast and Internet student news outlets unless stated otherwise. The unit of analysis in this study is the college Media Advisory Board; researchers sought to focus both on schools with and without such a board in an effort to gauge what factors correlate with the existence of such a board. Researchers believed the media adviser at each campus would be the most reliable source of information about the Media Advisory Board at that campus; therefore, a survey instrument was constructed and sent to all members of the College Media Advisers organization. 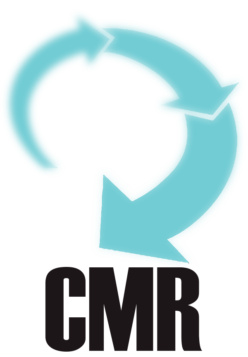 CMA, formerly known as the National Council of College Publication Advisers, was established in 1956 and is the best known association of U.S. college media advisers. CMA provided a mailing list for its 641 current members. After eliminating entries with missing or false e-mail addresses, all 621 remaining names were checked individually against duplicates. To raise awareness, we notified CMA members of the upcoming survey via the organization’s listserv, in hopes of raising awareness. A nationwide, online survey invitation was sent out in June 2011 with (1) a letter, explaining the purpose of the study and promising anonymity, (2) a promise to send the survey results to participating advisers, and (3) a unique hyperlink that allowed only the e-mail recipient to fill out the online survey. Three weeks later, reminder e-mails were sent to those who had not yet responded. We received 168 responses, which were then screened to ensure that no more than one person represented a particular school. During data cleaning, we eliminated 11 data points, as they either missed a majority of the questions or provided multiple numbers that defied face validity. This left us with a final sample of 157 complete responses, yielding a response rate of 25.3 percent. Only six advisers reported their school had a second Media Advisory Board, usually for a different medium. Data on the second board was not included due to the small number of cases. One of the authors of this study completed a survey to include data on that writer’s school. The sample characteristics paralleled the population parameters of the college media advisers on two key variables. Some 68 percent of the CMA population worked at public colleges and universities, compared to 66.0 percent of the survey’s sample. Eighty-one percent of the CMA population worked at a four-year school, compared to 84 percent of the survey respondents. The results were important since the researchers expected the type of school (public vs. private, four-year vs. two-year) would help explain some of the variance in issues, such as whether a school had a Media Advisory Board. A strength of the study was that a substantial percentage of respondents (39.5 percent) reported they did not have a Media Advisory Board at their school, allowing the researchers to compare the characteristics of schools with a board and those without. The survey used multivariate analysis to see what independent variables could help predict the existence of such a board. Information on other organizational issues also was collected such as the board title, its composition, where it was located in the academic organization chart when the board was created, and whether it had any bylaws. Advisers then were asked about the current functions of their board. In creating the survey instrument, researchers consulted with more than 30 mission statements of Media Advisory Boards to be sure that these functions listed were representative. The functions range from “selecting Editor-in-Chief/Station manager or other top positions” to “integrating journalism curriculum.” Respondents rated each function based on a scale of one (not important at all) to five (extremely important). The study also examined possible discrepancies between advisers’ perceived importance of board functions and how they, personally, would prioritize the board’s functions. A majority (60.5 percent) of those responding (n = 157) reported their schools had a Media Advisory Board. There was a wide range of time frames as to when boards were established. Seventeen percent of schools with boards reported they have been in existence for five years or less. The average (median) age of a board was 25 years. But there was a large amount of variance; almost half of the schools – 48.3 percent – reported their board has been in existence for 20 years or more. The researchers also analyzed advisory boards based on the type of college media with which the boards were affiliated. Two primary models emerged. In the first, schools used an advisory board for the school newspaper and, in some cases, various other print activities (which could include the yearbook, a general interest magazine, and/or a literary magazine). A majority of the respondents (48 of the 97 schools, or 52 percent), said they used this approach; 29 of the 48 focused solely on the campus newspaper. The second model focused on a combined board for both broadcast and print activities; 39 schools, or 42 percent, used this approach. Six schools reported using separate boards for individual student media activities. (They are reported separately here, but also could be listed under both print and broadcast.) A final four schools reported a board dealing with just broadcast media. The heavier focus on print may be due to the respondents being drawn from the membership of CMA, which started out as a publications-only advisers’ group. In RQ1, we asked about the types of schools at which Media Advisory Boards are most likely to exist, and what characteristics of a school help explain the differences. 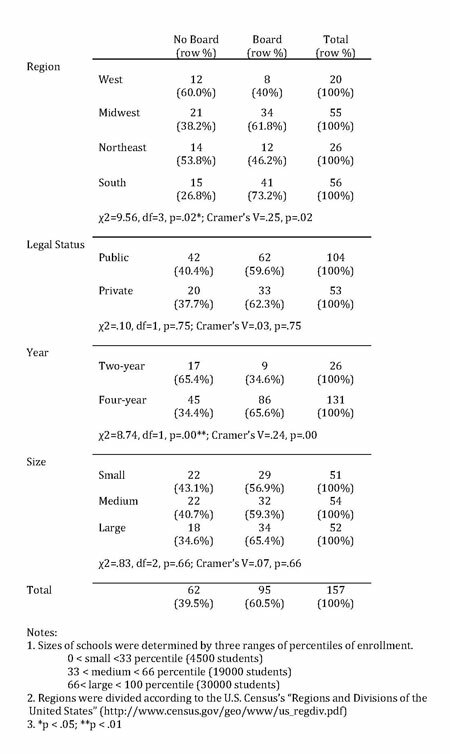 As Table 2 shows, regional differences were significant (χ2 = 9.56, df = 3, p = .02; Cramer’s V = .25). Nearly three quarters (73.2 percent) of Southern schools had a board, while their Western counterparts were more likely than others not to have one (40 percent). We also found a significant difference associated with the type of school. Only about one of three two-year schools (34.6 percent) reported having a board. Conversely, almost two out of three four-year institutions (65.6 percent) featured advisory boards. The overall statistical model confirmed the differences (χ2 = 8.74, df = 1, p = .00; Cramer’s V = .24). Enrollment size and legal status of the school did not correlate strongly with the presence of a media board. Public colleges were no more likely to embrace or reject media boards than their private counterparts, and the presence of the board was similarly distributed across small, medium, and large institutions. Table 2. Distribution of the presence of media boards across region, public vs. private, two-year vs. four-year, and enrollment size. RQ2 asked how Media Advisory Boards differed in terms of size, title, location within the university and formality of operation. 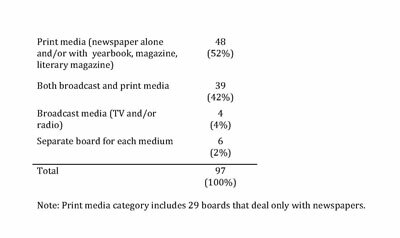 Sizes of media boards varied considerably from 3 to 43 members, with an average size of 12 members. Sizes of the boards did not vary significantly across some key school characteristics, such as public vs. private, two-year vs. four-year, size, enrollment, and region. As shown in Table 3, there was, nonetheless, a great variety in the titles of the media or publication advisory boards. After removing the name of any specific student organization, there were 42 different titles reported. After condensing, most centered on such common terms as “media” (39 mentions), “publication” (35 mentions) and “advisory board” (9 mentions). In terms of an organizational chart, the boards were located in a wide variety of areas. Some 31.6 percent of boards were located in Student Affairs, 16.8 percent in Academic Affairs, and the others were described as “independent,” were located in an academic department, or were in a variety of settings. In terms of their formality of operation, 76 percent reported operating under a set of bylaws. Sixty-eight percent took minutes at meetings. RQ3 inquired into the composition of Media Advisory Boards and what characteristics of schools helped explain the compositional differences of the board. Figure 1 details the proportions of groups commonly found on advisory boards. Student journalists (20 percent) and faculty (20 percent) were most heavily represented, followed by representatives of the student body (19 percent). In contrast, administrators (11 percent) and student government (6 percent) representatives were much less visible in board composition. 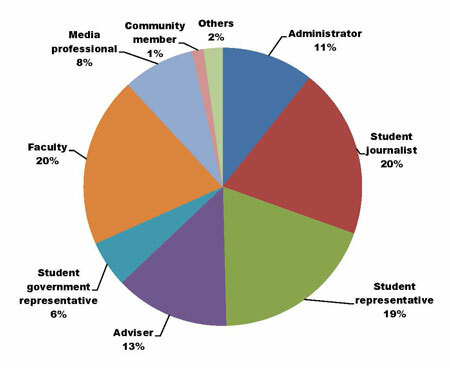 Given the average board has 12 members, a typical board might have two to three members who are student journalists, two additional students, one to two administrators, one to two formal advisers, two (additional) faculty members, one media professional and another, varied member, such as a student government representative. There was no significant difference in board composition across two- and four-year schools or in composition across regions. The researchers also focused on whether two school characteristics – public vs. private status or size – made any differences in terms of board composition. Two factorial ANOVA analyses (Table 4) confirmed effects of both characteristics. First, advisers (F = 19.69, df = 1/92, p = .00) and student journalists (F = 4.53, df = 1/92, p = .04) were more likely to be found on the boards at private schools than they are at public schools, along with representatives of the student body (F = 9.11, df = 1/92, p = .00). Second, both student reporters (F = 3.35, df = 1/92, p = .04) and advisers (F = 25.06, df = 1/92, p = .00) were much less likely to be included on boards in larger schools than were they in smaller ones. For example, advisers only accounted for 5.9 percent of board membership in large colleges but more than four times more (24.4 percent) in small colleges. Student journalists in small schools took up an average 25.8 percent of seats on boards, compared to medium-sized (20.35 percent) and large (14.12 percent) schools. Larger schools, however, do show a stronger presence of student body representatives (large, 25.63 percent; medium, 22.36 percent; small, 8.14 percent). RQ4 investigates the kinds of key functions commonly served by advisory boards (e.g., select student media leaders, serve as a bridge with administrators, offer post-publication critiques) and how those functions are prioritized in the boards’ work against advisers’ expectations. The researchers employed 11 items to measure functions of media boards. They asked advisers the operational importance of each function the board carries out. Then advisers were asked, in an idealized world, how important they would consider each function. Answers ranged from a high of 5 (extremely important) to a low of 1 (not important at all). Two sets of mean scores were tabulated for both operational and adviser-valued importance (see the second and fifth column in Table 5). After rank ordering the scores separately, it was found that “elect EIC/Station Manager or other top positions,” “defend student media if content is challenged,” and “serve as a neutral sounding board if content is challenged” were the top three functions in terms of both operational and adviser-valued importance. Consistency was also found in some of the lower-ranked functions. For instance, the boards took an insignificant role in “supervising the adviser,” “selecting other staff leaders,” and “previewing content before release,” as advisers desired. Next, the researchers subtracted operational importance from adviser-valued importance, hoping to find out how advisers’ ideals deviated from the real world. A paired t-test revealed several interesting patterns. Advisers desired for the board to take an even more active role in “defending student media if content is challenged” (t = -6.96, df = 94, p = .00), and “serving as a neutral sounding board if content is challenged” (t = 5.05, df = 94, p = .00), albeit both functions are already top priorities of the board, as described earlier. Moreover, functions including “serving as a bridge between the student media and administration” (t = -3.66, df = 94, p = .00), “integrating the journalism curriculum” (t = -3.30, df = 94, p = .00), and “providing ideas for media content” (t = -2.67, df = 94, p = .01) need more attention from the board, advisers indicated. Even though “previewing content before release” was the least important function in most boards (Mean = 1.85, SD = 1.01), it could be argued that advisers wanted to see an even lesser role of the board (t = 2.16, df = 94, p = .033) in prepublication. For two additional items — “provide ideas for media content” and “preview content” – the gaps between reality and advisers’ ideals may not be significantly wide in a practical sense due to their small effect sizes (Cohen’s d = .23 and .12, respectively) near or below .20, as defined by Cohen (1988). RQ5 dealt with how satisfied advisers were with the performance of the Media Advisory Board. Advisers were asked to agree or disagree with specific statements about the operation of advisory boards. Most statements were cast in a positive frame and asked advisers to judge their own boards against an ideal situation, from a journalism point of view. Answers ranged from a high of 5 (strongly agree) to a low of 1 (strongly disagree). For the first five indicators, a majority of advisers said they agreed with the positive statements about board performance. For example, they see their board as understanding that some student errors are part of the learning process (77 percent agreed) and that the board is supportive of a watchdog role for the student media (63 percent). A majority said they were satisfied with the advisory board (63 percent) and that it has had a positive impact on the student organization it oversees (62 percent). A narrow majority (51 percent) said the board is effective in its oversight role. Less than a majority (24 percent) agreed with the statement with the board can supply continuity at down times for the student organization. Only 23 percent agreed that they would recommend changes to the board’s operation. Only 5 percent agreed the board would prefer the student organization to be more of a positive public relations tool for the administration. In a final effort to gauge adviser satisfaction with board performance, advisers were asked how they would “rate the influence of the administration on the board’s operation.” Only 4 percent said the administration was “very influential,” an additional 4 percent said it was “influential” and 31 percent said it was “somewhat influential.” The majority, 61 percent, agreed that the administration was “not influential at all.” Therefore, despite the many conflicts involving board operation, as reported to SPLC and elsewhere, advisers were generally positive when asked about the performance of their own board. In answering RQ6, we focused on what characteristics of the school and of the adviser correlate with higher satisfaction of media board performance. 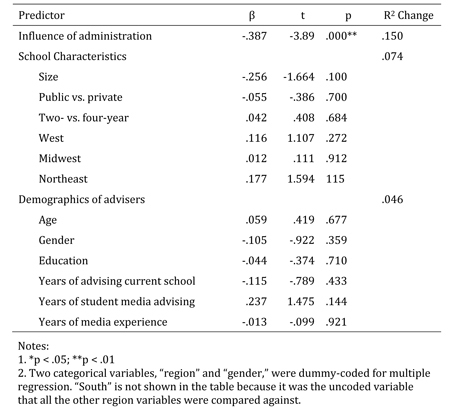 We used hierarchical regression to test if perceived influence of administration, school characteristics (size, public-vs.-private, two- vs. four-year, and region), and demographics of the adviser (age, education, years of advising at current school, years of student media advising, years of media experience) explained satisfaction. The model was significant in explaining 27 percent of the variability of satisfaction, R2 = .27, adj. R2 = .14. Perceived influence of administration alone accounted for 15 percent of the variability of satisfaction (t = -3.87, p = .00) and was the only variable with significant predictive power (see Table 7), indicating that when advisers perceive lower influence of the administration on the media board, they are more likely to be satisfied with the board’s performance. There has been considerable scholarly interest in the issue of campus media censorship (for example, see Butzow, 2008; Lisosky, 2010; LoMonte, 2011a, 2011b; Peltz-Steeler, 2001; Student Press Law Center, 2009; Yam, 2008). But not much inquiry had been done in examining advisory boards – the “mediator” between student media and administration. This study has bridged the gap by offering both a broad view and microscopic view of college Media Advisory Boards across the United States. Several patterns emerged from the data. First, the researchers observed both similarities and differences in terms of some basic characteristics of advisory boards. Having an established advisory board seems to be a common practice at U.S. colleges and perhaps more common than it was in the past. Looking back at Self’s (1994) finding that half of JMC colleges reportedly had advisory boards in the early 1990s, we now have a majority of schools that responded that have a board (60.5 percent). As described by Henderson (2004), there has been a resurgence of interest in advisory boards; 44.8 percent of those in this study’s sample were established after Self’s study in 1994. The sizes and titles of the boards showed considerable diversity across the sample. Even though this study found the average board size of 12 members, a number slightly higher than what Click (1993) recommends, the size of each board varied from school to school, covering a spectrum from three members to 43 members (SD = 5.76). The variety of board titles perhaps responds not only to the variety of schools but also to the arrival of online media forms. Second, advisers had a clear expectation that one of the primary roles of advisory boards should be to serve as a buffer between administration and student media should friction arise, rather than controlling the media in editorial or managerial terms. Advisers in this study reported that most advisory boards did a satisfactory job of serving as a neutral sounding board or even a defender of student media if content is challenged. In fact, the researchers were pleased to see similarity between how advisers rank current board functions and how advisers would rank these board functions in a perfect world. The finding has largely dismissed the enduring concern, at least for these schools, as raised by Mencher back in 1965, that advisory boards could turn student media into “public relations arm” rather than a “laboratory of life.” Only 5 percent of the advisers in this study would describe their advisory boards as public relations arms of the administration. However, the finding does not offer any permanent peace of mind, because the advisers also pointed out room for improvement and suggested that media boards should more aggressively pursue their buffering roles. Third, board membership was well-balanced overall with some differences across school types. Here we borrow Click’s (1993) “lay vs. expert” model to understand a healthy board composition. Click maintained that a balanced board would have a balanced number of both expert members “with training and expertise in journalism, law and business” and lay members “who represent leaders in general and who may be uninformed” about journalism and publishing businesses (p. 18). We understand the balance as a structure to avoid elitism, a possible product of an expert-dominated board, as well as to avoid predominantly layman decision-making, which might lead to the disregard of journalistic practices and conventions. This study found almost a tie among the three largest groups: student journalists (20 percent), study body representatives (19 percent), and faculty (20 percent). Student representatives speak for the majority of readers, or laymen; student journalists are the largest group of journalism practitioners, or experts; and faculty can be both laymen and experts, average readers with the perspectives of educators, or experts who give professional advice. Private and public schools tended to have different preferences in assembling media boards. Private institutions seemed to value expert members more than their public counterparts by including higher numbers of journalists and advisers. Due to less First Amendment protection in private schools (Lisosky, 2010), a heavier presence of experts may help counterbalance a more perceivable influence from the administration. Public schools, where the First Amendment exerts its full power, tend to have a much higher percentage of student representatives. By giving the laymen, namely the students, more voice in the media board, public schools seem to have a distinct way of balancing the power of the press without the administration being directly involved in the editorial business. Fourth, we were surprised to see a high rate of satisfaction with the Media Advisory Boards’ performances. According to the advisers, media boards were good at “understanding that some student errors are part of the learning process,” “appreciating the watchdog role that a student media organization can assume,” and having “a positive impact” on the student media. As mentioned earlier, the high satisfaction seems to be a result of a low perceived influence of the administration. Again, this finding is inconsistent with potential critics’ apocalyptic concerns about suppressive media boards. Rather, with low administrative influence accompanying more trust among members and better performance, a virtuous cycle seems to be in place. Media boards, however, still need to be more helpful in dealing with quality dips due to graduation and other logistic reasons. The literature warns many things might go wrong since the board is handling a variety of delicate issues. Surprisingly, this study suggests that potentially controversial board issues such as defending student media, serving as a bridge between student media and administration, trying to mandate pre-publication review and supervising the adviser, most likely do not go wrong, at least in the eyes of the advisers. This study has several limitations that can circumscribe the generalizability of the results. Rather than all the college media advisers in the United States, the surveyed population was confined to the members of College Media Advisers. The sample was drawn online on a voluntary basis, a method used for many web-based surveys. The evaluative responses came solely from advisers; their visions of how a media board should work may differ significantly from those of other key players. The study was based in part on a panel discussion led by the authors at the CMA Spring Convention in New York City, 2011. The authors would like to acknowledge the research assistance of Tebben Lopez. Benigni, V., Ferguson, D. & McGee, B. (2011). Establishing a ‘renown-gown’ relationship: The role of advisory boards in communication programs. Journalism & Mass Communication Educator, 66, 1, 54-68. Bert, R.E. (1952). Trend is toward supervision of student newspapers. Journalism Quarterly, 29, 4, 62-65. Bodle, J. (1997). The instructional independence of daily student newspapers. Journalism & Mass Communication Educator, 51, 4, 16-26. Brandon, W. (2001). Campus newspapers: A path into the newspaper industry. College Media Review, 38, 1, 5-6. Butzow, M. (2008). The Hosty ruling: Predictions of its chilling effect are so far exaggerated. College Media Review, 46, 1, 17-26. Click, J. W. (1993). Governing student publications. Memphis, TN: College Media Advisers. College Media Advisers. (undated). CMA: Code of Ethics. Accessed 12-19-11 at: http://www.cma.cloverpad.org/Default.aspx?pageId=1111735. Dorazio, P. (1996). Professional advisory boards: Fostering communication and collaboration between academe and industry. Business Communication Quarterly, 5, 3, 98-104. Duscha, J. & Fisher, T. (1973). The campus press: Freedom and responsibility (pp. 13, 59-60). Washington D.C.: American Association of State Colleges and Universities. Henderson, J. (2004). A survey of advisory board ABCs … Advice, Balance, and Charge. Journalism and Mass Communication Educator, 59, 1, 60-76. Inglehart, L. (1993). Student publications. Ames: Iowa State University Press. Ingram, S. (2010). Winning the battle, losing the war: Three years later, former Viking News staff voices frustration with settlement. Student Press Law Center, 15. Accessed 7/21/11 at: http://www.splc.org/news/report_detail.asp?id=1567&edition=53. Keister, M. (2009). Newspaper policies addressed following “’Walk Of Shame” column. Student Press Law Center. Accessed 7/27/11 at: http://www.splc.org/news/newsflash.asp?id=1990. Kleiman, H. (1996). Student electronic media and the First Amendment. Journalism & Mass Communication Educator, 5, 2, 4. Kopenhaver, L. L. & Spielberger, R. (2009). 2009 study of advisers shows improvements, causes for concern. College Media Review, 46, 4, 23-29. Kopenhaver, L. L. & Spielberger, R. (1989). Are independent college papers really independent? College Media Review, 28, 1, 5-7. Kress, G. & Wendell, A. (1993). Departmental advisory councils: Bridging the gap between marketing academicians and marketing practitioners. Journal of Marketing Education, 15, 13, 13-20. Lisosky, J. (2010). The last unprotected press: Time to examine freedom of expression at private universities. College Media Review 48, 1, 24-30. LoMonte, F. (2011a). Fighting censorship: A life-changing decision, vindicated by history. Student Press Law Center. Accessed 10-3-11 at http://www.splc.org/wordpress/?p=2543. LoMonte, F. (2011b). Two cautionary tales for college presidents: Flout the First Amendment at your own risk. Student Press Law Center. Accessed 10-3-11 at http://www.splc.org/wordpress/?p=1272. Mencher. M. (1965). The campus newspaper: Public relations arm or laboratory of life? Phi Delta Kappan, 216-220. O’Dell, F. (1936). History of journalism education in the United States. Teachers College Record, 37, 6, 543-545. Peltz-Steeler, R. (2001). Censorship tsunami spares college media: To protect free expression on public campuses, lessons from the ‘College Hazelwood’ case. Tennessee Law Review 68, 481, 2001. Accessed 10/3/11. Pullen, R. (2005). Doing more with less is the mantra of burgeoning enrollments. Journalism & Mass Communication Educator, 60, 1, 27-30. Self, C. (1994). University-industry task force finds complex alliance activity. Journalism & Mass Communication Educator, 49, 1, 32. Accessed 7/29/11 at: http://search.proquest.com/docview/215278239/130DC49812F3389ED41/24?accountid=10796. Shalash S. (2011) Administration says it will not defund print edition of student paper. Christopher Newport University dailypress.com. Accessed 7/27/11 at: http://www.dailypress.com/news/education/dp-nws-cnu-newspaper-20110607,0,1390214.story. Student Press Law Center, (2009). 2009 Annual Report. 5. Accessed 7/28/11 at: http://www.splc.org/pdf/annualreport2009.pdf. Student Press Law Center. (2003a). Office leases, strings attached: Student government, school officials try to use leases to gain control of newspapers. 27. Accessed 7/21/11 at: http://www.splc.org/news/report_detail.asp?id=1046&edition=27. Student Press Law Center, (2003b). Big Brother? Media Board chairs say they uphold free press rights, but some editors are skeptical. 24, 3, 26. Accessed 7/19/11 at: http://www.splc.org/news/report_detail.asp?id=1012&edition=26. Student Press Law Center. (2003c). Student editors protest plans to implement media boards. 27. Accessed 7/17/11 at: http://www.splc.org/news/report_detail.asp?id=1013&edition=26. Student Press Law Center. (2002). Editor seeks changes for media board. 8. Accessed 7/19/11 at: http://www.splc.org/news/report_detail.asp?id=862&edition=22. Teitel, L. (1995). Using advisory committees effectively in higher education. Journal for Higher Education Management, 11, 1, 59-70. Turner, S. (2008). Student media boards: About (p. 5). In Messenger, K. & Turner, S., Picking the best editor in chief. College Media Review, 45, 3, 4-8. Yam, E. (2008). Going it alone: Freedom from school control can come in many forms. Student Press Law Center, 29, 2, 4. Accessed 5/6/11 at: http://www.splc.org/news/report_detail.asp?id=1410&edition=45. Zweifler, S. (2011). Advisory board: Firing of UT-Tyler adviser not a First Amendment issue. Student Press Law Center. Accessed 7/19/11 at: http://www.splc.org/news/newsflash.asp?id=2227. James Simon is professor and chairman of the English Department at Fairfield University, where he directs the journalism program. He started a college newspaper as an undergraduate student at the Rutgers-Livingston campus. He later served as faculty adviser to that publication and to student newspapers at the University of the Pacific and Fairfield University. Lei Xie is an assistant professor of English and journalism at Fairfield University, where he teaches new media and photojournalism. He was a journalist in mainland China and received his master’s degree in mass communication at Southern Illinois University Carbondale. His scholarly interests include computer-mediated communication, social construction of climate change, visual communication and college media. He is the faculty adviser to The Fairfield Mirror, the student newspaper.